This potato masala curry recipe is easy to follow and we are making this potato curry without a pressure cooker. We are also not using coconut milk or onions in this easy potato masala curry recipe. In this recipe you can see how to make easy potato masala curry in a pan or pot over stove top. Potatoes can be used in curry recipes in many different ways and there are lots of different recipes for potato curries. Potatoes are known as urulaikizhangu or simply kizhangu in South India. 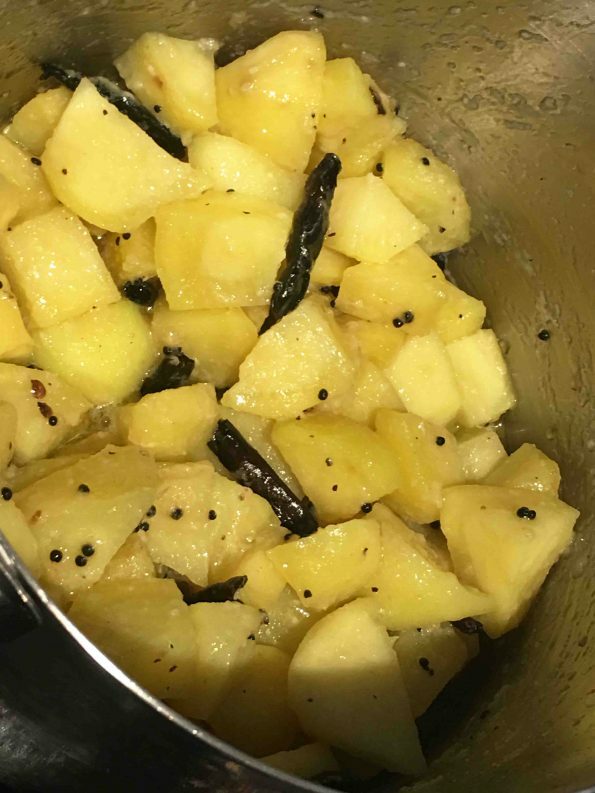 Indian potato curries can be made in many different ways and each of them are unique in its way of preparation and most of them can be used as a delicious side dish for chapathi r rice. 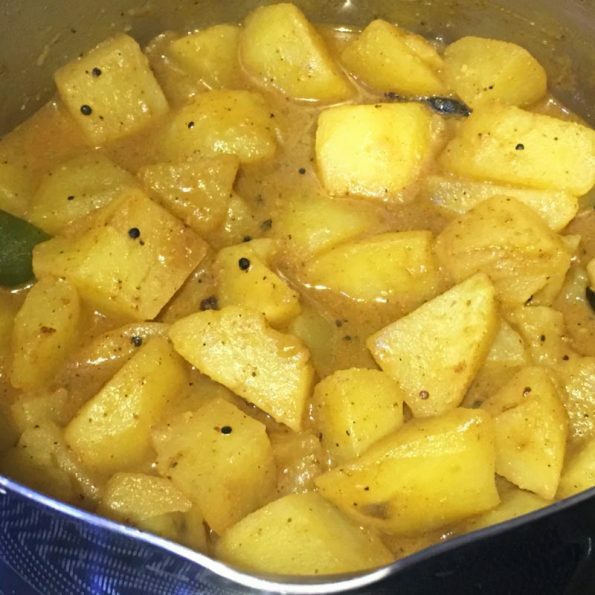 Previously I have posted the easy potato curry recipe for chapathi where the potato curry is made using a pressure cooker. I have also posted another potato curry recipe for rice, where we use coconut milk to make the curry but the gravy is made very little as we want the curry to be quite thick. (this is commonly used for Kerala feast and it is made with onions and lots of cashews as well). This potato masala curry recipe is used to make very easy potato masala curry for rice or chapathi using a pan and we don’t use coconut milk in this. (you can add a bit of coconut milk if you want, towards the end of the recipe). And I have not used any onion in this recipe, so this is so easy to make just with potatoes and spices. This easy potato masala curry is a perfect side dish for rice, chapathi or poori or appam, or even dosa or idli and I enjoyed this potato masala curry with the semolina yeast pancakes I made. So even if you don’t have a pressure cooker or if your pressure cooker is in the dishwasher, and if you are out of coconut milk, you can still make this easy potato curry in a pan. This is a very easy recipe with very less work involved, but since we are not using a pressure cooker to cook the potatoes, it takes the extra time to cook the potatoes in the pan until the potatoes are cooked and soft. You can adjust the spices as you wish! So here is how I made this easy potato masala curry for rice or chapathi following this simple potato masala curry recipe. You can easily prepare this vegetarian/vegan Indian style potato masala curry in a pan or pot and it makes a very delicious side dish with chapathi, poori or rice. Peel the potatoes and dice them in to small to medium sized cubes. When the mustard seeds splutter, add the red chilies and fry for a few seconds. Add the diced potatoes and salt, mix well. Add the ginger garlic paste and green chilies, mix well. Saute the potato mixture for about 1 to 2 minutes. Now add all the spices except the black pepper powder and mix well. Saute the contents for another 1 minute. Add the 2 cups of water and bring it to a boil. When the water starts boiling, reduce the heat to low heat and close the pan with a lid. Cook in low heat for about 10 to 15 minutes or until the potatoes are cooked well and really soft. The stove temperatures may vary and so you should check in between to see if the potatoes are cooked. Also stir in between occasionally. 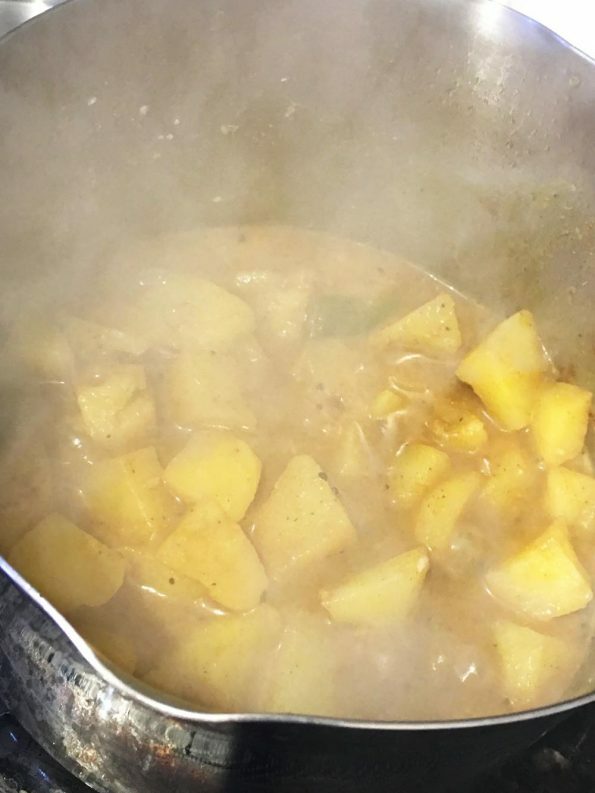 Once the potatoes are cooked and soft, you can check if there is enough gravy for the curry as you need it. If you need little more gravy, you can add some more water and heat for another 1 to 2 minutes so everything will blend together nicely. However adding too much water will make the curry very thin which won't be very good. So if you are adding extra water just add a little more water (not more than 1 cup of water). Finally, sprinkle the black pepper powder (if using) and mix well. Your potato curry is ready to serve, you can switch off the stove and transfer the pan fro the stove top so it won't get cooked any more. Serve the hot potato masala curry with rice, chapathi, poori, dosa, idli, appam or anything as you wish! 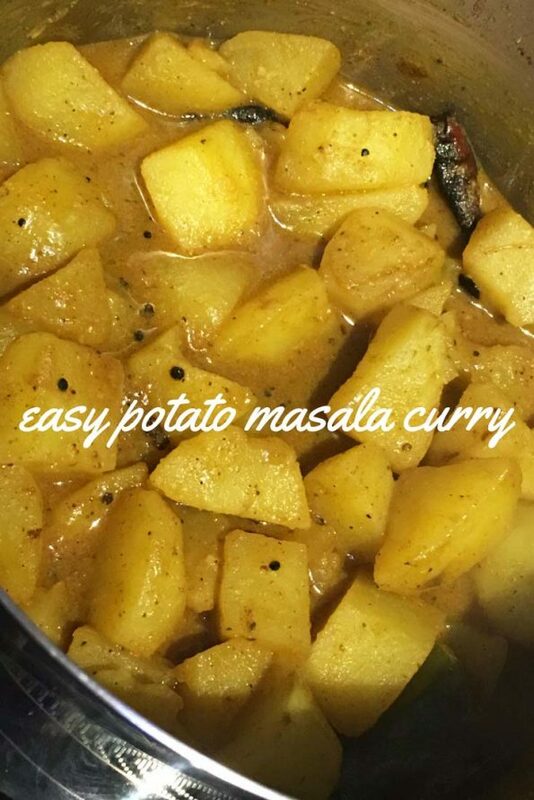 Hope you found this post on easy potato masala curry recipe helpful!